My son is now 18 years old so it has been quite a few years since I colored Easter eggs but while I was at the grocery store today I saw a Paas set of five color cups for $1.99 and I thought what the heck it might be fun to color some eggs tonight. So I grabbed a couple dozen eggs for under $2.00 a dozen and was off for a little fun. Never one to be satisfied with colors straight out of the box I decided to experiment with a bit of over-dying. Here are the results. Here’s what I did. 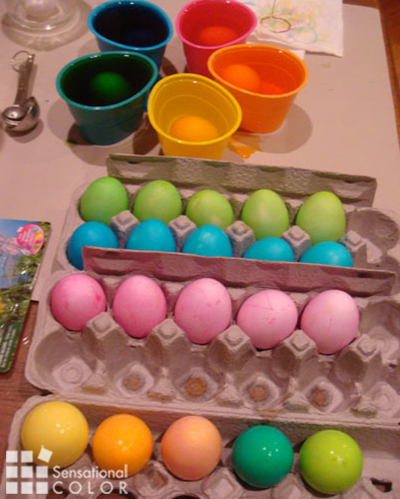 I started with 25 eggs and dyed 5 eggs in each color for 3 minutes. Since I these cups only hold one egg at a time this took me about 20 minutes. The blue dye turned out the darkest. The red dye didn’t take very well and turned out splotchy but once I dyed the in a second color the results were pretty interesting. 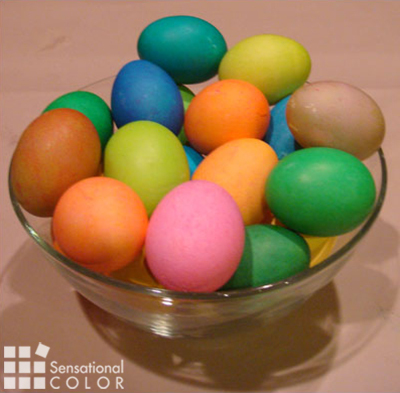 I then took all the 5 yellow eggs and put one in each dye cup for 3 minutes, then 5 orange eggs, then 5 pink, 5 blue and 5 green. Here’s the first batch of the original yellow eggs are done and the original orange eggs are in the dye cups. 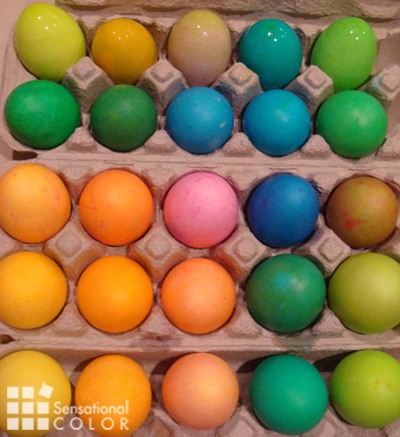 All yellow eggs were over-dyed and from left to right the second dye bath was yellow-orange-pink-blue-green. I was careful to keep each subsequent row in the same order so that I would know what two color produced what. 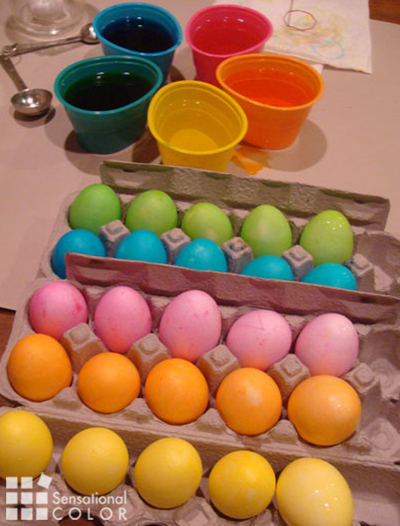 And here they are with all 25 eggs dyed twice. I ended up with eggs in 25 different colors. Although some look the same in the photo no two eggs are exactly the same color. Not bad for less than $6 bucks and 45 minutes. Yes, that is another fun way to decorate eggs.